It's finally safe to go back on Twitter: Nicki Minaj vs. Taylor Swift has been put to rest. A day after Swift apologized to Minaj for inserting herself into the rapper's musings on the lack of diversity among the VMAs' nominees, she has gone one step further, empathy. Today on Good Morning America, Minaj made her astute case once again ("We can’t just have one type of body being glorified in the media because it just makes girls even more insecure than we already are") before addressing Swift's apology. “It takes a big person to do what Taylor did," she said. "Everyone sometimes speaks out of turns. I’ve been there. Sometimes we do things and we don’t think right away or we don’t investigate, and then we just talk. So it was big of her to come out and say that. So, yeah, we spoke for a long time. We were cracking up laughing on the phone. It’s over, you guys. I love you guys for supporting me. 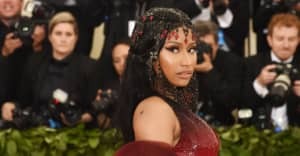 Thank You.” For more on how Nicki's monologue was on point, read FADER's recent article on how the VMAs have been historically biased against black artists.